Now that the last of fall’s leaves have blown away, our mountains are coming into sharper focus. Gazing up from the valleys, we are surrounded by peaks; looking down from the Blue Ridge Parkway reveals Jackson County’s seemingly endless array of mountains. In fact, winter with its long-range views may be the best time to hike. Just how many mountains are there? Based on an online USGS list, the answer is about 185 named summits. Another source, which rates Jackson first in the state in number of peaks, puts the number of mountains at 113, though it doesn’t count quite a few summits that are very close in height, which likely explains the difference. Both online lists identify the peaks based on the quadrangle they’re found in, and there’s a fair amount of duplication, with the same name sometimes identifying more than one summit. Both Greens Creek and Tuckasegee quadrangles have a Black Mountain, with the Tuckasegee contender taller by almost 500 feet. Sticking with colors, we find Brown Mountains in both Glenville and Tuckasegee. Glenville’s wins the height contest, 3,680 to 3,400, and 6,032-foot Yellow Face is the final entry on the list. Our tallest mountain (as well as the highest point along the Blue Ridge Parkway) is Richland Balsam at 6,410 feet. Jackson County’s other 6,000-plus summits are Waterrock Knob at 6,292 feet; Mount Lyn Lowry, 6,260; Browning Knob, 6,260; Mount Hardy, 6,140; and Reinhart Knob, 6,100. 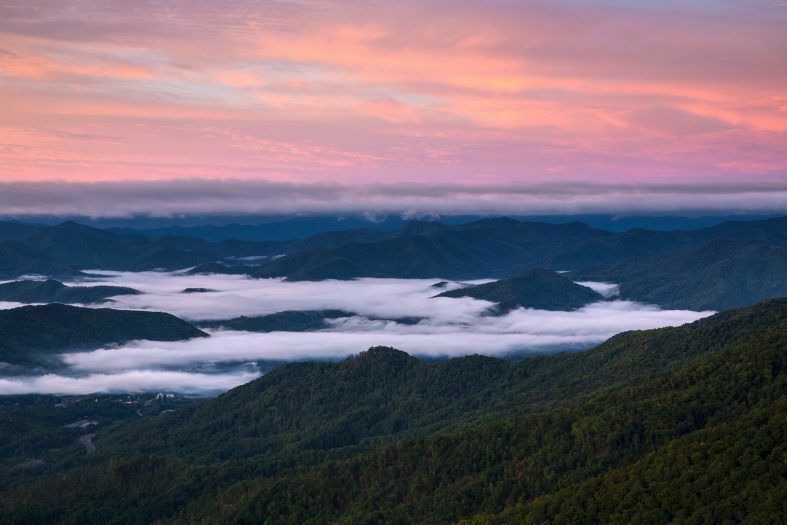 Turning our attention to the girls’ first names category, we find Jenny Knob (Sylva South, 2,939 feet), Lizzie Mountain (Big Ridge, 3,840 feet) and Polly Mountain (Cashiers, 3,040). Guys’ first names enjoy a similar level of popularity. A quick look at the list reveals four peaks with masculine monikers – Jacks Knob (Cashiers, 3,040), Joe Mountain (Sylva North, 3,478), Charley Bald (Sam Knob, 5,574) and Jonas Fields (Sylva North, 4,700). Animal-derived names may be the most numerous, and many of the more popular ones are duplicates. Alphabetically we find two Bears, two Bearpens, four Buck Knobs, Bull Pen, Buzzard Roost, Cow Mountain, Eagle Knob, Fox Knob, Goat Knob, Hogback, three Panther Knobs, two Rattlesnake Knobs, Rattlesnake Mountain, Raven Knob, Sheep Knob, Sheep Mountain, Sheepback Mountain, Terrapin Mountain, two Wolf Knobs and two Wolf Mountains. Plant-inspired names are plentiful as well. We find, again according to the alphabet, Cedar Cliff, Cedar Cliff Mountain, Cherry Knob, Chestnut Knob, two Chestnut Mountains, Dryland Laurel, Fern Mountain, Grassy Knob, Grassy Top, Hickory Flat Knob, Hickory Flats, Hickory Mountain, two Laurel Knobs, Moss Knob, Pine Knob, Piney Cliff, Piney Knob, Piney Mountain, Piney Ridge Knob, Poplar Mountain, Potato Knob, Prickly Ash Mountain, Rye Mountain and two Sassafras Knobs. Some appear to have been named according to their shape, size or other characteristics: Awl Knob, Big Knob, Big Mountain, Chimneytop Mountain, Coldsides Mountain, Cove Hill, Double Knob, Double Top, two Doubletop Mountains, Flat Mountain, two High Knobs, High Point, two High Tops, Lone Bald, Pinnacle, Pump Mountain, three Rocky Faces, Round Mountain, View Rock and Whiteside Mountain. “Little” mountains are especially popular. We find Little Bald Rock Mountain, Little Cow Mountain, Little Green Mountain, Little Hogback Mountain, Little Panther Knob, Little Pilot Mountain, Little Sheep Cliff and Little Terrapin Mountain. Our mountains are mostly in the 4,000- to 5,000-foot range, but we do have nine below 3,000 feet. Pine Ridge is the shortest at 2,300 feet. The most intriguing name? Tuckasegee’s Lost Knob. How could anyone lose a mountain that stands 5,467 feet above sea level?